News this month that Royal Naval Fleet Flagship HMS Ocean is to be decommissioned in 2018 prompted a trip down memory lane here at BD, as we remembered our first call from The MoD, when we were contracted to develop new wall finishes for this unique and versatile vessel. 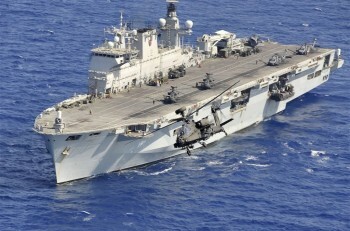 HMS Ocean is an amphibious assault ship, the Royal Navy’s sole Landing Platform Helicopter (LPH). At 203.4m (667ft) long, Mighty O has a range of 8,000 miles (7,000nmi) and cruises at a speed of 15 knots – 18 knots when she’s travelling at top speed. Designed to support Commander UK Amphibious and Landing Forces, Ocean has seen action off Sierra Leone (2000) and alongside Ark Royal in Iraq (2003), as well as supporting many rescue operations around the world, achieving stardom on the small screen in Channel 5’s “Warship” documentary and even providing a helicopter landing site during London’s 2012 Olympic Games. Her story began in 1993, when she was constructed by Kværner (Govan) on the River Clyde. Vickers Shipbuilding and Engineering Ltd (VSEL) were awarded the contract for fitting her out, with a highly competitive and somewhat controversial bid that treated her design as that of a merchant ship with military hardware ‘bolted on’. It was against this background that BD first encountered Mighty O, with a contract to develop special finishes for the ship’s interior wall panels that would meet Naval Engineering Standards NES 711 and 713. Our brief was to deliver a solution that met the most stringent smoke and toxicity regulations, yet offered an attractive laminated finish, which was very popular at the time. However standard laminates were unusable because they would splinter when exposed to the intensity of an explosion. The challenge was to develop a new laminating process that would remain stable during operation. To maintain certification standards in situ, the laminate-like wall surfaces needed to be bonded to steel sheet. With steel and the surface materials having totally different expansion coefficients, the laminate, being the weaker of the products, was liable to crack. Having carried out extensive trials and exhaustive toxicity, vibration and drop testing, BD solved the problem by developing a process with a flexible adhesive, that allowed both steel and laminate to move independently. The result ensured that Ocean’s walls would be reliably strong, resilient, safe and secure in heavy seas and under fire. The wall units also had to be easily de-mountable, for quick release and ease of access throughout the ship in the event of fire or an explosion. Our response was to develop the BD Flush Omega system, where individual panels could be removed from a run, without any need to de-mount the entire wall. This first encounter was not to be our last. Over the years, BD has returned to HMS Ocean several times, to undertake projects ranging from fitting out new Messes, re-fitting replacement panels and doors in cabin areas and replacing and upgrading shower & toilet facilities. It has been an honour and a privilege to contribute to her long career at sea. When she is finally decommissioned, HMS Ocean will be a tough act to follow.